Say it often enough and it becomes truth: Sandpoint is an arts town, Sandpoint is an arts town…. But how many Sandpoint-area artists actually display their work here? How many make a living off their art? It’s an interesting question, especially when Sandpoint has as many exhibition spaces as nearby Coeur d’Alene and yet only one-fifth the population. Or when one gallery closes — Timber Stand, representing the late wildlife artist, Stephen Lyman — while two more open. 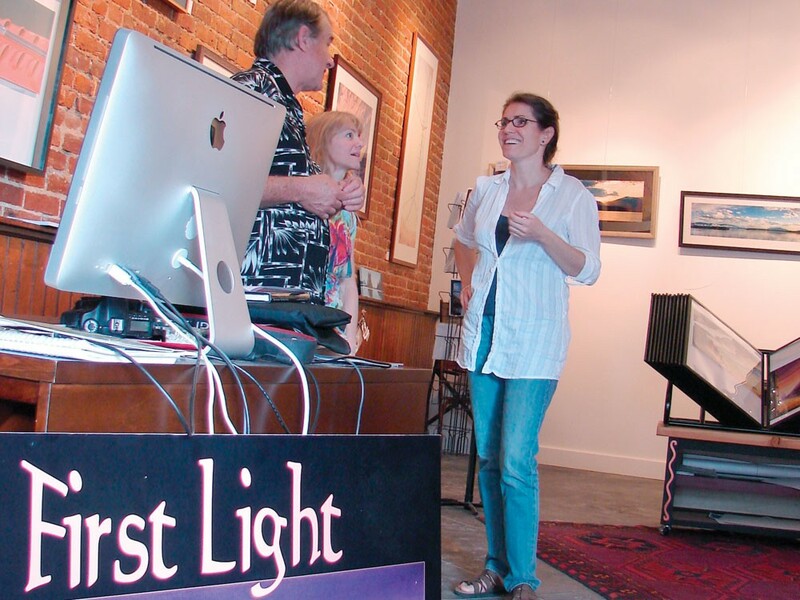 This spring, First Light Gallerie replaced Stage Right Cellars wine shop in the space owned by the adjacent Panida Theater. It’s now where musician and artist Scott Kirby sometimes plays intimate concerts on the baby grand, while above him hang vibrant watercolors from his self-published Visions of the Great Plains. Next to his paintings are photographs by Do Verdier, his wife, who runs Sandpointphoto.com out of the gallery. Recently they’ve begun exhibiting the work of other artists like Shelby Young. While First Light is more studio than gallery at present, down the street is a more traditional gallery. Overlooking the interior of the Cedar Street Bridge (former home of Coldwater Creek retail) is The Gallery, the first stage in what owner Shery Meekings envisions as an integrated arts-and-performance space. A recent transplant to Sandpoint, Meekings was poised to open a printing business when artist Stephen Padgett approached her about the bridge location, which another artist, Dan Earle, had previously used to organize informal ArtWalk showings. With its abundant light and rustic-but-warm log interior, Meekings instantly saw the potential. With little gallery experience — she was working at Schweitzer’s gallery when she met Padgett — Meekings drew on her real estate and restaurant background as well as a lifelong love of art (she is a glass jeweler). Then, while researching a business model, she found Jason Horejs. The owner of the enormously successful Xanadu Gallery in Scottsdale, Ariz., Horejs is the author of “Starving” Artist to Gallery Artist: An Art Marketing Guide for Growing Your Art Career and Becoming a Gallery Artist. Recently, in the first of many workshops and classes that he intends to offer through the gallery, he shared his ideas with local artists. The lesson plans included pricing, inventory, market research — all the stuff they don’t teach you in art school, the persistent remnants of a long-held belief that somehow commerce taints creativity. Consider Pend Oreille Arts Council’s ArtWalk, showing a range of work — from novice to nationally known — in more than two dozen locations from June through September. POAC also holds monthly juried exhibitions; one features area high school students and their instructors. Yet not everyone embraces art equally, as a recent Bonner County Daily Bee article noted. Public response to the idea of spending $7,000 in city funds to relocate steel cutout artworks (currently hanging on downtown poles to a traffic roundabout) was resoundingly negative. Or as economist William D. Grampp in Pricing the Priceless notes, art is a “merit good” — something people feel they should value, even if they aren’t yet willing to support it with resources. And even if one local writer was heard to mutter that he couldn’t come downtown in the summer, the arts are good for business, which Tim Frazier of the Cedar Street Bridge Café says is one of the best Sandpoint summers he’s seen. Whether or not that translates into sales for artists in Sandpoint — or Coeur d’Alene, or Spokane, or in any community — is another story, one we’ll have to leave for another time.